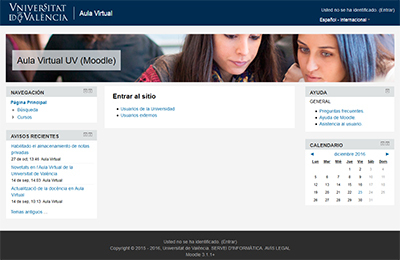 The Virtual Classroom is an implementation by the Computer Service of the open-source platform moodle at the Universitat de València, which offers virtual group spaces for professors and students as support to face-to-face teaching. The platform is a web application of easy access and we can use it through the website of the Virtual Classroom and once our UV account has been validated, we are ready to use it. Users have at their disposal a manual and support for using the application, from the platform users can manage activities, develop questionnaires, share documents, create discussion forums, to send email notifications by email, or to have personal or group calendars, among other options. The Virtual Classroom offers to the professors of this University the possibility of creating virtual research communities linked to the research projects composed of staff of this and other universities. The groups of all the subjects offered by the UV will be activated at the beginning of each academic year. Each of the groups is composed of the professors and the data is obtained of the POD data base (Teaching Organisational Plan) and for the students enroled, according to the official enrolment data. If the teaching groups of a professor are not correct, the POD databases should be checked from the Virtual Classroom and they should request an updating of the Virtual Classroom from the requests application. Regarding to the students enroled, each professor can consult directly the enrolment data base and update the Virtual Classroom with the procedure “Students enroled” available in each of their groups. According to the experience of previous users the creation of sub-groups is not done in order to avoid the duplication of work in the maintenance of the subgroups: however, the professor can request the creation through an express request. For example, the subject of the degree in Psychology “12386 Psychometrics. 9 credits (6 Theoretical Sciences. 3 Practical Sciences) has 6 groups from A to F, of which the group A has 4 subgroups: T0, I1, I2, I3. A community is a work environment that the university creates on request by a teaching group or platform users. Its usefulness lies in the exchange of documents, information and communication through a virtual environment. In short, this is a collaborative tool which provide the development of work in research groups composed of researchers of this university and others. Therefore, the creation of a community needs to fill out an application form, indicating the name and email address of the administrator and other members. By default, the administrators can add new members, news, appointments in the calendar, documents, etc., while the members only have permission for consulting the information added by the administrators. Moreover, the administrators also can modify the permissions awarded by the members of a community. Note: For adding non-university users is needed the name, surnames and address to be used. This address will serve for identifying the platform and the password will be send automatically to the users via email to the same address. SUPPORT FORM (PAS and PDI).